Twitter creates 200 emoji for Rio Games; Bad poll news for Trump. 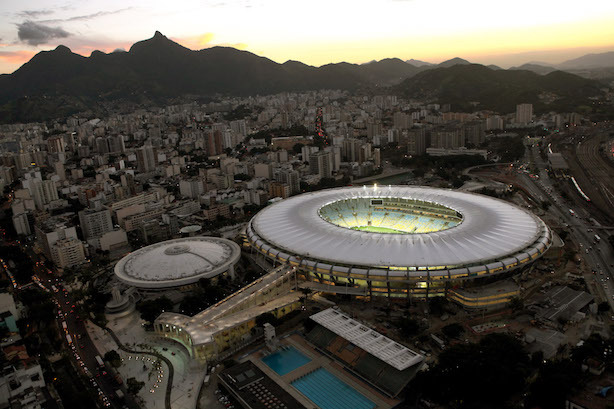 The Maracana Stadium in Rio (By Erica Ramalho/Portal da Copa/Março de 2013). Rio 2016 games set for awkward start. Police used tear gas to clear out crowds protesting the high cost of the 2016 Olympic Summer Games in Rio de Janeiro on Wednesday. Fans booed and chanted "Zika" at U.S. Women’s National Soccer Team goaltender Hope Solo after she posted a photo on Instagram of a stockpile of mosquito repellant. The opening ceremonies are scheduled for Friday evening, and Twitter is ready, rolling out 200 emoji for the Games. Campaign trail: Some good, some bad, and some weird news for Trump. Hillary Clinton has a double-digit lead over Donald Trump nationally, according to a new Fox News poll. President Obama’s approval rating is the highest of his second term. Mike Pence endorsed Paul Ryan despite Trump’s vow not to. Trump pulled close to Clinton in fundraising with impressive July haul amid Republican panic. New questions about the size of Trump’s Twitter following. Drink sales take a healthy turn. Sales of bottled water could outpace those of soda as soon as this year, according to Beverage Marketing Corp. The group expects companies to ship 12.6 million gallons of bottled water, more than the 12.4 million of soda. By next year, the difference could be more than a million gallons in favor of bottled water. Snapchat's rise. The New York Times’ Katie Benner and Michael de la Merced on how Snapchat went from a strange curiosity to advertisers to their social platform of choice. (Preview: Marketers like the shiny new thing). Fortune: Instagram’s new Stories feature could be a real dud. Nike quits golf. The sportswear brand, for years identified with Tiger Woods as much as any athlete, is pulling out of the golf equipment business, saying Wednesday it will stop selling bags, clubs, and balls. It will stick with golf footwear and apparel.